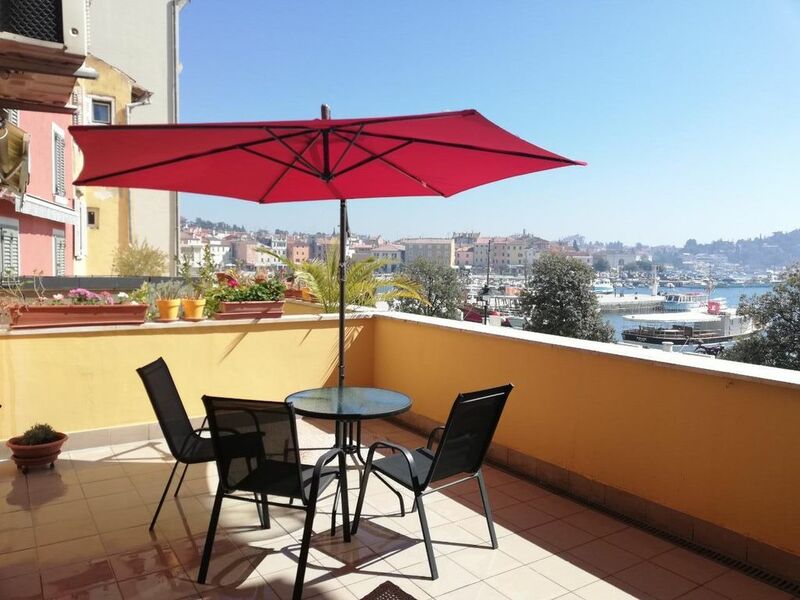 Nice apartment with sea views in the city center, facing the sea. This 3-star hotel is located in the historical center of Rovinj. The apartment is facing the fishing port and it's near the Hotel Adriatic. The apartment is renovated in 2016 and it's up to 3 persons. Provides all modern amenities such as Wi-Fi, flat-screen satellite TV, and air conditioning. Studio features a fully equipped kitchen, living and dining area, hair dryer, towels and linens. There is a double bed and a bedroom with a single bed. You can enjoy the sunbathing on the pebble beach which is only 110 meters. The Baroque basilica of St.. Euphemia is only 5 minutes away, and the ferry port is located 250 meters from the residence. This apartment is lovely! It has a large terrace that looks out on the water and plaza. There is ample space for two people. The extra small room was great to store our luggage. It is located right in the centre of the old town, shops/ restaurants/swimming area are all nearby. The owner is very helpful. The restaurant at the foot of the steps (one flight) Segutra has excellent food and treat you like neighbors. We booked Ivona for a tour of the Istrian Peninsula. We would definitely stay at Tina’s apartment again and highly recommend it. Excellent location right on the old town harbor. Nice terrace for morning coffee, drying clothes, or an evening glass of wine. Everything in good working order, clean, and supplied with all the essentials needed. Owner is helpful and kind. This property was perfect for us. It had everything, including a wonderful host family that couldn't have been more helpful. The location was amazing - overlooking the Rovinj harbor, close to the market, restaurants, boats for touring, and gorgeous scenery everywhere you looked. Would highly recommend for a stay in a quiet, lovely town. From before our arrival Tina ensured that everything was done to make our stay in Rovinj stress free. Arrangements were made for us to be collected at the airport by her Mum and Tina was waiting for us when we arrived at the apartment. The gift of wine and biscuits was much appreciated. The apartment is so central and has everything in it you could need. The views from the balcony were spectacular and it was wonderful to enjoy our breakfast each morning looking out across the boats moored in the harbour. In all a wonderful holiday in a very special city. The pictures do not do this apartment justice - it is lovely and spotlessly clean. There is everything you need (and more - first aid kit, candles, hand soap, etc.) for a holiday. The balcony must be one of the best in Rovinj - views of the harbour, lots of people watching, boats coming and going, and you can see (and hear) the live music from the square. You get the sun on the balcony from morning until about 3 pm. Tina was exceptionally nice and very accommodating with our dates .She met us outside the apartment and came personally to collect the key before we left. She was available by telephone if required. We appreciated the wine/water/biscuits she left as a welcome gift for us. We stayed two weeks in this apartment and loved everything about it. We would highly recommend it and hope to return in the future. Re a reviewer's comment about the Nightclub below the apartment - when we were there this was closed and boarded up, so not sure what is happening with it. This apartment had everything we needed on our holiday, but just in case you're interested there is no iron/ironing board. Great location, views, host - all spectacular! I cannot say enough lovely things about this apartment. We loved every moment of our time in rovinj and Tina’s perfectly appointed home away from home. She was fabulously accommodating. We are already planning our next trip back!!!! Highly recommend 5 star experience our favorite place we stayed on our 3-week trip in Croatia. Rovinj is a small city with historic charm and a long history. The symbols and traces of past times preserve many ancient ruins and home in downtown. The excellent geographical location with a mild climate, diverse and rich content for each guest tailored and long beaches and interesting surroundings contribute to tourist success. Very oft in the center are entertainment programs. Haustiere- Euro 20 Euro extra für die Reinigung. CHECK IN 14 h/ CHECK OUT 10 h KOSTENLOS: schneller Internetanschluss-WLAN,Klimaanlage,Strom, Gas, Wasser, Bettwäsche Erstbelegung, Handtücher (Wechsel ab 7 Tage),Geschirr, Kaffemaschine,Wasserkocher. / Pets- Euro 20 euro extra for cleaning. CHECK IN 14 h / 10 h CHECK OUT FREE : high speed Internet access - Fi, air conditioning , electricity, gas , water, bedding Erstbelegung , towels (changed from 7 days ) , dishes, coffee maker , kettle.